Character.org recognizes schools and other organizations for Promising Practices in character development. The Practice must be based on, or tied to, at least one of the 11 Principles. Thus far schools in Oklahoma have received 70 Promising Practices since 2010. Follow this LINK to see ALL of the Oklahoma Promising Practices. Drops of Kindness - Dove School of Discovery, Tulsa, Oklahoma. Drops of Kindness is a school initiative that allows students to use jeans day money to make a positive difference with their chosen service/service learning project. C4 Curriculum - Dove Science Academy, OKC Oklahoma City, Oklahoma. The Dove C4 Curriculum Program requires staff and students to work together to develop monthly projects/events that tie the classroom curriculum directly to Character, Community, College, and Career. MAC Deaf Community Outreach - MacArthur High School, Lawton, Oklahoma. MAC Deaf Community Outreach is a celebration of deaf culture and brings awareness of deaf culture to our students; furthermore, this club works with members of our community to build relationships. Honoring the Voices of Young Children - Muskogee Early Childhood Center, Muskogee, Oklahoma. The Reggio- Emilia philosophy focuses on student-centered experiential learning by using professional collaboration to facilitate student-led learning that honors & empowers the voice of the child. Tiger Time: Special Tigers Club - Pryor High School, Pryor, Oklahoma. Special Tigers student leaders apply for leadership roles and are trained to work with special needs students to promote leadership, community service, and caring attitudes toward peers. Shoes for Kenya - Sadler Arts Academy, Muskogee, Oklahoma. "Shoes for Kenya" Reaching the world one heart at a time. 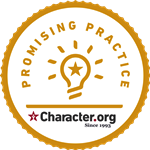 For 2017 Character.org awarded 300 Promising Practices in character development to schools, districts and youth-serving organizations from across the United States – as well as from China and Mexico. 8 Promising Practices were awarded to Oklahoma schools and 1 to a foundation in Lawton. Charity Week provides students the opportunity to research charitable organizations and raise money for them while learning about the needs, services, and impacts in the field and in the classroom. Partner's Club facilitates a mentoring/partnering relationship between regular education students and students with disabilities; students interact with one another in numerous activities. For five years, Ike Ignition Lead2Feed has conducted an annual service learning project in which freshmen and their mentors raise funds and food through various means for our local Salvation Army. Lincoln Elementary implemented Be a BUD-E to provide opportunities for learners to practice empathy and kindness through tolerance of diversity and respect while creating an inclusive environment. The Mac program is an intentional approach to instill the character traits of discipline, toughness competitiveness, love, and energy into our athletes in order to make them successful in life. Tomorrow’s workforce is in today’s classroom and it is imperative students graduate high school with skills, knowledge, and experience, prepared for college, careers, and L.I.F.E. If you are interested in beginning the process of applying the 11 Principles for the purpose of evaluating the culture of your school this is a great place to start. Character.org generally opens the application window during November or December.